When I first evaluated Maggie for a physical rehabilitation and pain management consultation, it was clear to me that she was dealing with a lot of pain from an ongoing injury to her knee. Maggie was in foster care at Muttville Senior Dog Rescue and had suddenly lost her ability to climb stairs at her foster home. From her physical exam, her posture, and her gait I thought it likely to be an acute injury on top of a past problem with her 'Anterior Cruciate Ligament' (ACL) - ouch! The ACL keeps the 'shin bone connected to the thigh bone' - as the old song goes - and, if torn, these two bones slip and slide on each other. This is really uncomfortable and causes heat, pain, inflammation, and swelling in the knee joint. Because a dog's rear legs are always in use and ligaments have poor blood supply, not regenerating well once damaged, if the ACL is fully ruptured, the injury never really heals. Without the ACL ligament to hold the knee in a normal position, prolonged slipping and sliding of the bones causes the cartilage to be destroyed in the knee. With the breakdown in cartilage we see terrible cases of 'Osteo-arthritis' with bone spurs and joint inflammation developing and causing extreme pain for the patient every time they take a step. ​Maggie is a very sociable girl who loves to interact with people and she doesn't know she needs to be careful on her 'old lady legs.' By the time we met, she was already suffering from a bad flare up of arthritis from walking around on the unstable knee. In fact, it was so painful that she couldn't put full weight on this leg at all, instead shifting it to her other legs to compensate. And because she was unable to bear weight on both rear legs, she couldn't go up and down the stairs. The muscles in the affected limb had begun to atrophy and she was indeed headed towards a steady downward spiral. From the outset, we knew she needed help and wanted to save Maggie from a future filled with pain! 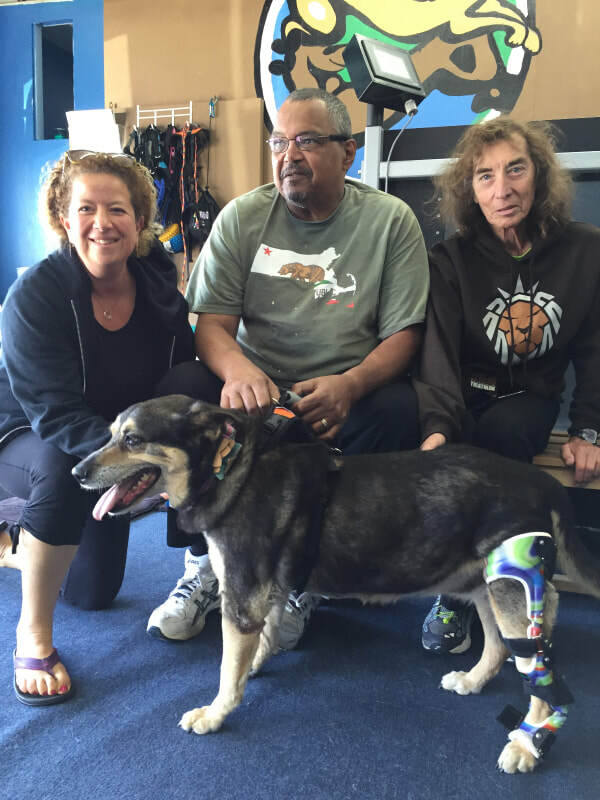 Luckily Muttville was willing to go the extra mile and have a Custom Stifle Orthotic (also known as a 'Knee Brace') made which was exactly what she needed! Soft 'knee wraps', 'ace bandages', or other 'off the shelf' solutions don't limit the abnormal motion in the knee and often make problems worse by causing pressures sores and associated soft tissue injuries. A recent study at the University of Kentucky has shown that the Ortho Pets custom knee brace is extremely effective in normalizing the biomechanics of the knee in patients with a ruptured ACL ligament! I proposed that we design and build a custom knee brace that would provide rigid stabilization for her knee in two of the three planes of motion. This brace would prevent the bones from slipping and sliding against each other and also prevent twisting and grinding when she walked. However the device would still allow her to bend her knee to sit, lie down, walk and to climb stairs. You can imagine that creating this is a specialized process! I think of it like designing a custom suit of armor to help stabilize her leg. Wearing it, she could regain her confidence in using the leg without being in pain. As you may know, I have been working with Ortho Pets in Denver, CO, undergoing advanced training that's given me incredibly valuable expertise in the process of designing and creating custom orthotics (braces). When it comes to orthotics and prosthetics, Ortho Pets are the folks with the most medical knowledge and expertise, partnering with the Canine Rehabilitation Institute and the vet school at Colorado State University! And with custom orthotics I've enjoyed a huge amount of success with many of my beloved senior patients regaining full use of their injured limbs. Seeing a dog transition from partially mobile and in constant pain to fully functional and pain-free is one of the most rewarding parts of my job! And that's also why it's been great to work with Muttville Senior Dog Rescue and Maggie. Her new adopters have brought her for follow up visits to provide physical rehabilitation for her injured leg and to retrain her to walk properly in her brace. We're currently working with a custom exercise plan to help her regain strength and build up her muscles and balance. And seeing her improvement, I am confident that she'll be back up to full senior doggie speed and pain-free in no time!